OCast muxarra, Hisp Ar moharra, L. Diplodus vulgaris, Ar. muharrab (sharp) Eng. two banded sea bream, white bream. It has an ovalar, compressed body, slightly convexed. As with all sea breams, it has eight incisive teeth in their mouths and a series of three to five molars in the roof of the mouth and two to four in the jaw. 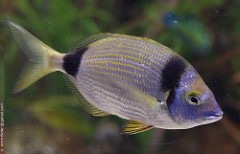 The silver-gray color makes this species, with black bands, conspicuous. One is above the pectoral fin and the other is just before the tail. It is from 2.5 to 3 cm in length. As it is smaller than the white sea bream, fishermen seek it less. It is found on all Iberian coasts and is abundant in Guipúzcoa where it was frequently eaten on fast days in the Middle Ages. It is rare north of Spain. It was eaten fresh on the coast. Elsewhere it was dried and salted or smoked. NOTE: No recipes for two banded sea bream have been found in medieval manuscripts. It is assumed that it can be prepared like other sea breams. See blog titled besugo published March 9, 2012. Also, it can be roasted and used to make fish turnovers as per Sent Soví's recipe. For this see blog titled lamprea published September 2, 2015.